Newsflash: marketers feel overwhelmed. According to a study by Emma, only 12% of marketers say they always meet work expectations. • A whopping 64% don’t have enough the time or personnel to do the kind of marketing they would like. 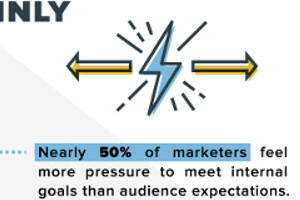 • They suffer from conflicting priorities, with nearly 50% reporting they feel more pressure to meet internal (organizational) goals than audience expectations. • Nearly 40% say they wish they could do more targeted marketing. For highlights from the report and tips on how to overcome marketers’ challenges, check out the infographic. Just tap or click to view a larger version.